A petition calling on the UK to accept more asylum seekers and refugees could be debated by Parliament after securing more than 100,000 signatures. It says the UK "is not offering proportional asylum" in comparison with its EU counterparts, amid a surge in migrants trying to reach the continent. Petitions on Parliament's website that exceed the 100,000 threshold are eligible to be considered by MPs. A cross-party group of MPs will decide whether to allow time for a debate. The petition, which had attracted 320,829 signatures by the end of Thursday, states: "There is a global refugee crisis. The UK is not offering proportional asylum in comparison with European counterparts. "We can't allow refugees who have risked their lives to escape horrendous conflict and violence to be left living in dire, unsafe and inhumane conditions in Europe. We must help." It comes as David Cameron faces pressure at home and from abroad for the UK to do more to help refugees fleeing to Europe from war-torn countries in the Middle East and Africa. 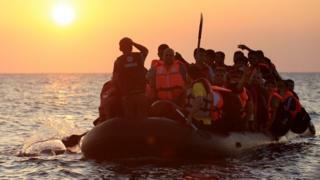 Calls intensified after publication of a picture of a drowned three-year-old Syrian boy lying on a Turkish beach. The prime minister has argued that more needs to be done to tackle the problem by bringing peace and stability to the parts of the world migrants are travelling from - adding that just taking more and more people was not the answer. Ministers say the UK has spent more than £900m in humanitarian aid to help with the Syrian crisis - more than the rest of the EU put together, according to ex-International Development Secretary Andrew Mitchell. The petition.parliament.uk site is designed to help people get issues on the political agenda and open up a "new dialogue" with MPs and ministers. More than 40 petitions passed the 100,000 signature threshold during the last Parliament, and a number were subsequently debated in Parliament, but critics say not enough were given parliamentary time.